Seattle-area homebuyers are getting a double dose of good news: More sellers are dropping their asking price to lure buyers — and buyers are then negotiating the price down further. In fact, among the 50 biggest regions in the nation, only 10 other metro areas currently have a higher rate of homes with price cuts. In some cases, sellers have had to reduce their price over and over again. Take a newly remodeled four-bedroom home just northwest of Green Lake that went on the market in mid-September for $950,000. The flipper who gutted and renovated the home must not have gotten any nibbles because within a week, the price was down to $899,950. A couple weeks later, it was down to $879,950. Still nothing. Another couple of weeks and it sank to $859,950. Another two weeks and they tried $839,950. Nope. This week it went back on the market at $799,995. But it’s not just sellers of pricey homes who are setting their sights lower. A small house in Rainier Beach, one of the cheapest on the market in the city right now, just had its asking price lowered for the third time — from the original $367,950 to $335,000 now — and the owner is throwing in a $5,000 closing credit. Realtors aren’t being bashful about the changes. “Seller says get it sold!!! So just reduced the price,” reads an ad for a West Seattle house whose owner has cut its price three times, by a total of $50,000. “HUGE PRICE REDUCTION!! !” says an ad written in caps-lock. “Come take advantage of this Amazing deal and walk into Instant Equity!” says a listing for a Carnation home with reduced price. And a home in Auburn: “Buyers, please read. We’ve drastically lowered our price! If you’re a serious buyer this is your opportunity to save some money and get a beautiful, quality and spacious home ‘under’ market value. The home is priced under both Redfin’s and Zillow’s estimates. So, please call to schedule a showing because at this price point the home may not last long on the market.” The home’s price cut — its fourth — was three weeks ago, and it’s still on the market. The average sellers cutting their list price here have reduced it by 3 percent, the same as the national average. In the city of Seattle and the Eastside, that translates to a cut of about $25,000 to $30,000. There are a few other ways to look at how buyers are reacting to list prices, and they all produce the same results. For instance, the share of homes selling in under two weeks — a sign that the list price was right — is falling faster here than anywhere other than San Jose. But here is a bucket of cold water in the face of anyone thinking Seattle is suddenly a great place to buy a house. 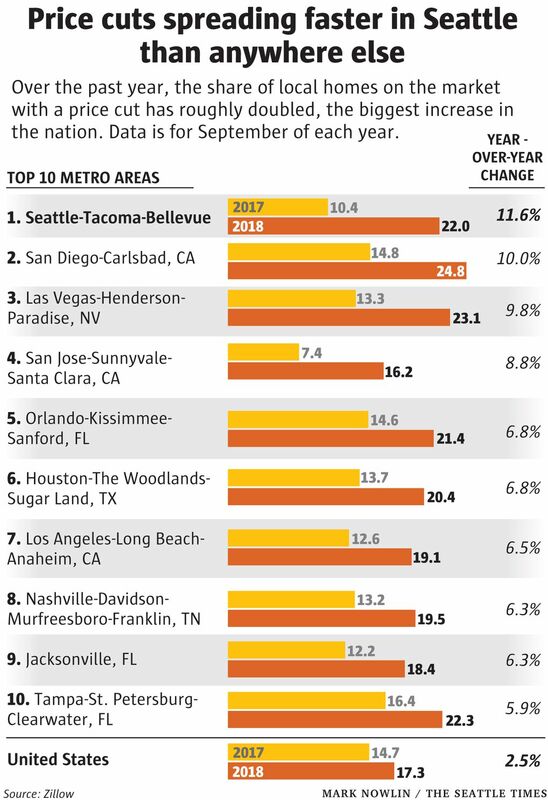 The fact remains that Seattle has some of the most expensive real estate in the country, and the changes in recent months haven’t put much of a dent in that. 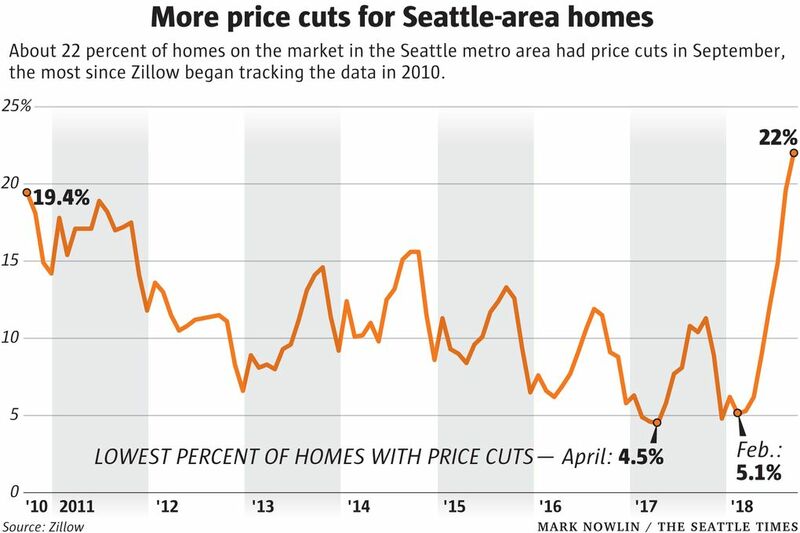 Just to hammer that home: Five years ago, the median house in Seattle cost $461,000. It peaked this spring at $830,000 — an 80 percent rise over five years. The median price has since dropped down to $775,000 — reducing the total five-year increase to 68 percent, still a huge amount.